A straightforward micro cache only a short distance from the small, well hidden church in the small village of Gorran Haven. This is a popular beach in the summer and the final cache will require a stealthy find. It is believed that there has been a church on this site since Celtic days although no evidence other than the name of the saint to whom it is dedicated can be found. The present church was erected around 1470 by Sir Henry Bodrugan – a powerful, wealthy and roguish character who was renowned for his outrages in the area. It is believed that he had a light maintained on top of the tower to guide in the boats which were used for his smuggling activities. The church and the lands, harbour and quays eventually became the property of the Edgumbe family until 1885 when the then Earl Edgcumbe transferred it to Ecclesiastical Commissioners. For a long period of time in the 17th and 18th centuries the church was in a state of considerable disrepair and for a while it was used as a fish cellar. It was restored by Piers St. Aubyn in 1885 and was subsequently licensed by Bishop Wilkinson in May 1885 for the performance of Divine Service and baptisms but not for marriages or banns. One wedding was conducted in the church in recent times under a special license granted by the Archbishop of Canterbury. The church is a delightful small building with a number of interesting features. One of these is that the tower is pentagonal in shape in order to accommodate the stairs. In the North wall behind the alter are two curious recesses which are still a puzzle as to what they may have been. The lower one may have been a holy well of some sort and the upper one may have been a Sacrament Oven in which Communion Wafers were baked although it seems to be too high up for this. Strictly, this little Church is a “Chapel of Ease” – a place where local people could easily go to for services rather than take to longer journey to the parish church at Gorran Churchtown. 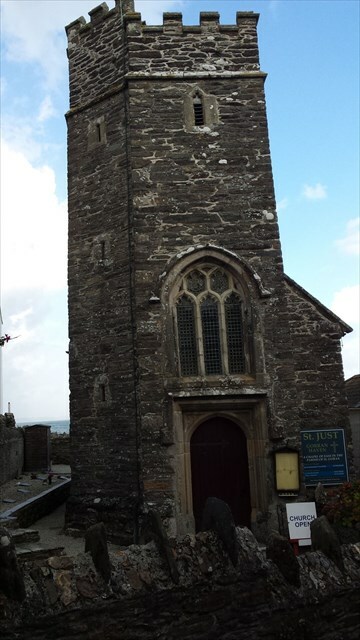 Whatever its history and pedigree – this little church is well worth a visit. After parking in the main car park at Gorran Haven, walk down the main road into the heart of this small fishing village (now a popular holiday beach and holiday home location). You will find public toilets and a number of small shops here – some open all the year round. At the entrance to the beach, turn left and walk a short distance up Church St to the headline coordinates of the Church itself. Notice the quaint street called Rattle Street on your left as you walk up the hill – up until the early 1980s there used to be a pub further down Rattle St. Stage 1 – at the headline coordinates, locate the bench dedicated to Andrew John Woodbridge. Note his dates on the small plaque on the bench. This gives you – AA.AB.ACDE – FD.AF.BFFE. Take the opportunity to look over the wall at the view from this cliff top church. The final is near a bench on a public footpath only a few metres away outside the church boundary. Zntargvp pnzbhsyntrq 35zz zvpeb haqre gur obggbz envy bs gur oynpx srapr oruvaq gur evtug unaq raq bs gur orapu (nffhzvat lbh ner fvggvat ba gur orapu) Rawbl gur ivrj.